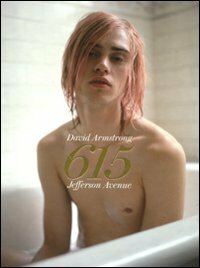 It was for his sharply focused portraits of young men-friends and lovers-that David Armstrong (born 1954) first gained critical attention, alongside his “Boston School” friends Nan Goldin, Jack Pierson, Mark Morrisroe and others. In the 1990s he changed tack somewhat, producing soft-focus cityscapes in which street lights, street corners and urban signage were elaborated into a soft blur. With 615 Jefferson Avenue, Armstrong returns to the subject of his youth. The photographer's first monograph in ten years, it gathers portraits of young boys taken in his turn-of-the-century row house in Bed-Stuy, Brooklyn, or at his farm in upstate New York, all of which were made in the course of taking fashion photographs. Low-key in their eroticism, these images always aim for a tangible, evident contact with their subjects: “It always has been this act of seduction, where you are trying to get the subjects to reveal themselves before the camera,” Armstrong put it in a recent New York Timesinterview. The rooms in which Armstrong shoots are painted in rich, dense, mint greens and browns, matching the period of the house itself, so that an atmosphere of enveloping interior catches the outlines of these boys, posed upon the many couches that fill Armstrong's home. Filled with the excitement of rediscovering familiar terrain anew, this volume collects 120 of Armstrong's color and black-and-white portraits.